In this training students will explore classical Yoga texts and practices that enrich the mind, body, and soul. This knowledge and experience will provide you with the tools necessary to build and support a thriving yoga practice. Expect to be inspired through this process and leave with the ability to effectively guide others on their path of yoga, allowing you to give back to your community! 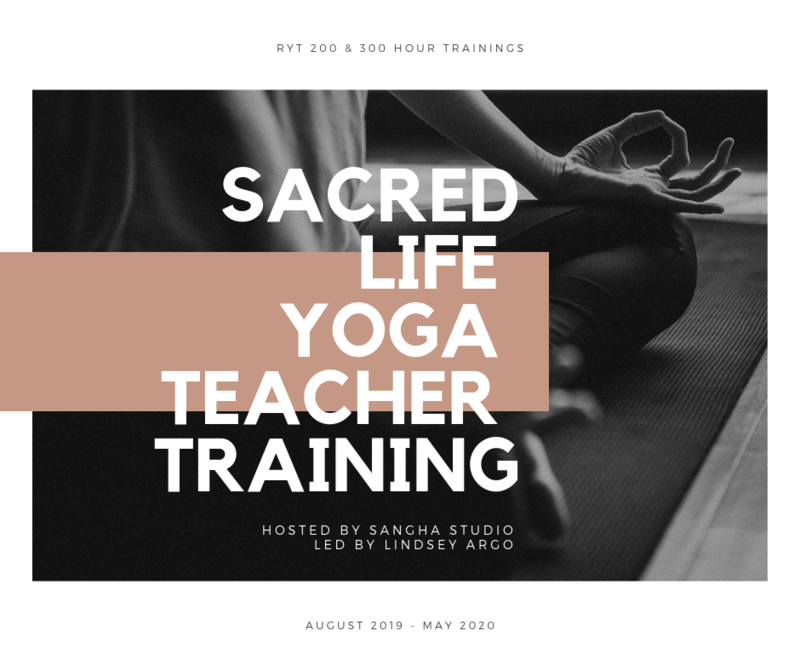 This program is designed with a comprehensive and interactive approach that dives deep into classical Yoga traditions, modern yoga research and applications, and helps the student develop techniques that can be employed to further the understanding of his/her own nature. The mission of this program is for you, as the student, to understand how to use yoga in your life and how to inspire others to use it in their lives. You will learn how to properly structure classes and how to teach those classes in a manner that produces an experience we all need and desire. This teacher training program’s objective is to provide the community with well-trained, knowledgeable, safe Yoga instructors who will inspire the individual student on the path of Yoga. This program is not a fitness training, but rather a comprehensive curriculum designed to engage the student in all aspects of the classical Yoga tradition as well as introduce them to current Yoga research and applications. This training meets and exceeds all the requirements put forth by the Yoga Alliance, the industry standard for Yoga teachers and schools. For further information on these requirements and registered teachers and schools, see www.yogaalliance.org. Practicum – More than any other training in the area! Some yoga experience! If you have only practiced at home or with online classes that is totally acceptable! We basically just want you to have some understanding of what yoga is. *300hr content topics will be similar to what is covered in the 200hr trainings, however each topic will be covered at a more in depth and advanced level. The 300hr content will also be more flexible and student led, so the interest and opinions of the group will be taken into account. *There will also be virtual sessions in the weeks that we will meet on that weekend, but we will choose those days/times as a group once training is about to begin to allow for flexibility. To attend the 300hr training we suggest that you have previously completed a 200hr training, as well as having at least one year of yoga practice under your belt. However, we are open to offering interested, dedicated students the chance to do the 300 if you have not previously done a 200. This will be on a case by case basis, so please reach out if this is something you want to pursue. We are open to students completing a 200 and 300 hour at the same time, please email us so we can chat further. Yes! We do require the training to be paid for by the time it is over, but please email us so we can come up with a plan that works for you. Do you accept payment plans for early bird pricing? Early bird pricing needs to be paid in full by June 30th, 2019. If you want to split up your payments until then that is fine, but once 6/30/19 comes around the early bird price point will expire. Is this training only for people interested in teaching yoga? No! We recommend this training to anyone who is interested in learning more about the practice. If I miss a training date can I make it up? Yes! We understand that life happens sometimes, so Lindsey can work with you to make sure you get all your hours in. Is this training Yoga Alliance Certified? Lindsey Argo has her E-RYT 500, YACEP, is Yin Yoga certified, and is an Ayurvedic Practitioner. Lindsey is a current Graduate student at Missouri State University studying South Asian Religions, Yoga, and Sanskrit and is finishing her thesis on modern interpreters of the Bhagavad Gita. Lindsey was trained by Beth Spindler, E-RYT 500 and Registered Yoga Therapist, who trained with disciples of Swami Rama and directly with Eknath Easwaran tying her students to the Tantric Yoga lineage of Sri Vidya. Lindsey is also currently finishing her Ayurvedic Practitioner program with Yoga Veda and plans to begin studies in Yoga Therapy in the next year along with applying for Doctoral programs. Would you rather have a downloadable form? Use the contact form below to request your application via email, please specify which training you are applying for! Once you submit your application Lindsey will reach out to you to set up a short meet and greet. This can be in person or via Skype. //any other questions? drop us a line!